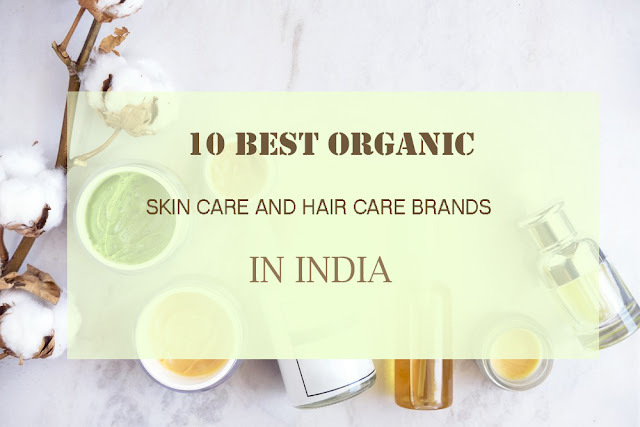 In today's post here is a list of 10 best Organic skin care and hair care brands in India. let’s check it out. ‘Burst of Happyness’ is aptly named because you’re one happy person after you use their awesome products. Founded by Shreya Sharan, this brand has a wonderful collection of skin and hair care products that she keeps adding into. The natural does are my current favorite. Her range includes body butters that I haven’t tried, some fabulous hair and skin soaps, bath pastes, skin masks (I swear by Clay-O-Patra!) and scrubs. Starting from as less as ₹260, you can also source some natural butter from her if you want to make your own products. They ship all over India. There’s a huge benefit when you buy products from Juicy Chemistry – you can identify the ingredients at first sight! The team behind this brand strongly believes that skin care shouldn’t be complicated. They believe that nature has to be a pure remedy to take care of our skin and hair. Juicy Chemistry has a vast range of skin care and hair care products. They also have recently started with mommy and baby products as well as some essential oils. I have used some of the body scrubs, soaps and nourishing creams that hydrate your body without stripping it off the essential oils. Kama Ayurveda that started in 2002 has become one of the most trusted organic beauty brands in India. They used to make their products using genuine Ayurvedic recipes, which are 100% natural as well as vegetarian. No artificial color or fragrance is added into it. Products like Brigandi Intensive Hair Treatment and Kumkumadi Miraculous Beauty Fluid has won many awards. Organic Harvest is an all-organic brand with extensive skincare, hair care, body care range and essential oils. They are made from the plants that are cultivated without the involvement of non-dangerous chemical fertilizers, herbicides or pesticides. Instead, we can rely upon ingredients and raw materials that are certified by global organizations such as EcoCert, OneCert, and Nature. This purely implies that they have no traces of harsh chemicals, parabens, phthalates, mineral oils, PABA, petrolatum, paraffin or any animal ingredients. This makes their range incredibly gentle, safe and potent. “Indus Valley” brand maintain the same spirit and inspired to use those ingredients to make beauty products which remind us those times. As we know that the development has brought in multiple problems. There is pollution; usage of fertilizers and insecticides has polluted our earth and food with toxic and harmful chemicals. Hence it was difficult to get herbs without the use of fertilizers or pesticides true? These certified organic herbs are the part of Indus Valley products with recipes that are given in Ayurvedic texts. This endeavor brings their products to the quality of products to that ancient period without a trace of pollution or any chemicals. Just Herbs is a pure, bespoke, and Ayurvedic results driven to the skincare made from certified organic and wild crafted ingredients collected across India. The brand stands for honesty and purity. Most of the people think that natural products are not as effective as chemically formulated ones. And it’s not like that. They are having so many ranges. And the brand is promising. I have used so many products from just herbs. I strongly believe the fact that there are no harmful things that are included. PurEarth is luxury skincare and wellness organic beauty brand that gathers all its ingredients from the Himalayas (claims). Their award-winning range of products addresses a growing perception towards clean and pure organic skincare products. Whether the products are from seabuckthorn from Ladakh and apricot from Uttarakhand, the ingredients that go into making are mostly handpicked by women in the areas. Based out of the Chennai, this new organic brand is making all the right waves everywhere. Mrs. Meher Farhana whose courtesy and coolness will blow you away definitely. The range of Amara’s products encompasses body scrubs, face scrubs, lip balms, hair cleansers and handmade soaps (I have used). My favorite product is Amara Organix Lavender sugar scrub for it smells is like heavenly and exfoliates without ripping your skin off moisture. My skin feels lighter for all the muck, dirt, grunge and dust is removed leaving it squeaky clean. Bliss of Earth is always referred to as mother earth because of the pure and unconditional love & care they used to offers. It has a huge treasure of health & wellness essentials hidden in the products. Whether it’s about being healthy or having beautiful skin and body, mother earth has all the things. The bliss of earth offers the same motherly care & love through its essential oils and other health & wellness products which I have used most in common. Try one today and set yourself to experience the true bliss of mother earth and share the experience with me. Mamaearth is not promoted as an organic brand per se, but why is it in this list can you guess? Because MAMA EARTH is certified. It is Certified Made Safe by America First Non-Toxic Certification Body which tests for toxic substances in the products. Mama earth is widely well known for their baby care products, but they have an entire line for expecting moms and every woman irrespective of age can use their products without any concern or harm.